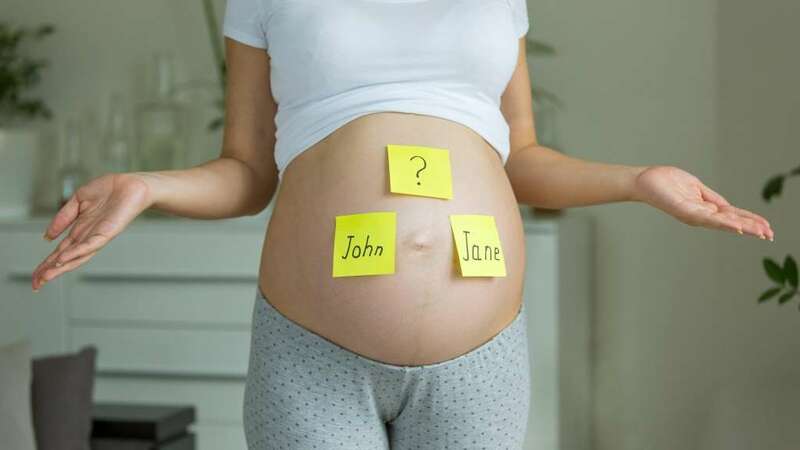 In fact, there is a website, The Baby Naming Experience that will show you grades and Eunice, well sorry if that’s your name, it fails to pass with an average grade of C-. When Julie and I named our five children, I was a bit hyperactive in the process. I wanted to consider every angle, but I didn’t want to be uptight with it, I wanted us to have fun. In the end, like most parents, we wanted to give our children names that we respected, that we felt their peers would respect and that they would grow to love and identify with the name over their lifetime. We even had a nice little Word document for the task and I added to it with each new child. I am not one to leave stones unturned. 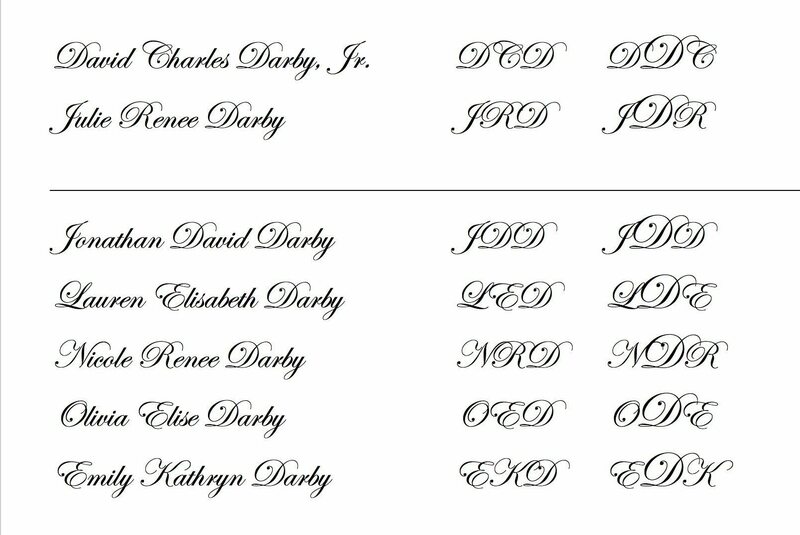 Our names in fancy, script writing along with monograms. 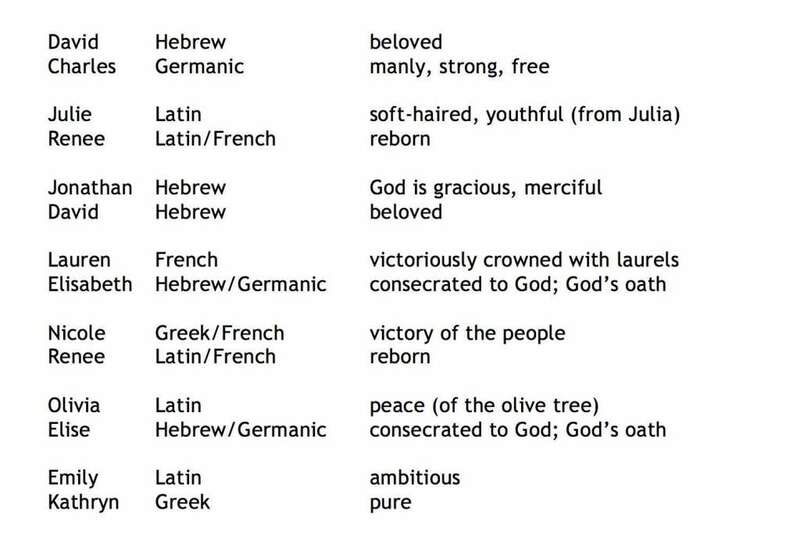 The historically-associated meaning of each of our names. 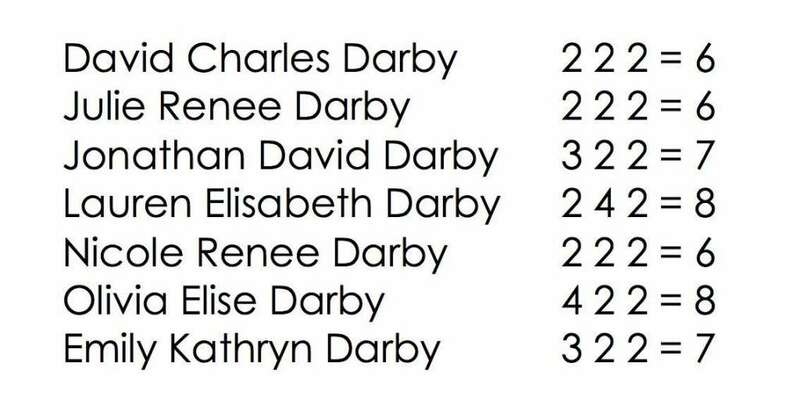 Number of syllables in our names. It’s funny now to see just how important this was to us and especially to me, the philosopher of the family. I checked so many details, including the cadence or rhythm of saying their name. And I followed the time-tested parenting rule of a great name which comes into play more when they reach toddler and teen stage, the yelling test. “Damnit Jonathan, did you do this?!? !” Yep, good name. “Lauren Elisabeth, you’re in trouble missy! !” Ooh yeah, that will work fine. One thing we didn’t do too much though. We didn’t ask friends or family. There were a LOT of family traditions and pains we sought to break free from so we wanted our own names, names that meant something to us but also represented that break. Other than our first-born son, there are no family names per se. And to ask our kids, they think we did pretty well. Of course, we were not perfect in their view. Even though I examined monogrammed initials, kids as only kids can do best, quickly learned of their initials around six to ten years old and sought to explore a weakness. With Lauren, we were aware of the LED comparison to lightbulbs and thought, “No big deal, LEDs are good.” And frankly, we saw no other issues. But one slipped through. Apparently, the older brother and sister added an E to Nicole’s initials to create “NeRD”. Oops, that one slipped by us, sorry Nicole. But no worries, as kids and nature are prone to do, she adapted, kind of like that Johnny Cash song, “A Boy Named Sue”. She became tougher emotionally and physically. They don’t dare call her that now, because she can kick both of their butts and wouldn’t blink to do so if pushed. How Do the Consultants Rate Our Work? So then, how do the professional baby-namers think we did? Well, not good I suppose. Jonathan averages a B- as the “Ultimate Networker” with dominant strengths in relationships and communication over finances, academics and health. Social networker? No way. Hard to say of course at 18 years old, but relationship (intimate) and communication, sure those are pretty accurate for him. He has little interest in formal academics but he has a high, creative and IQ so of course, he gets bored. He is a model of health and fitness but he gets a bit too hyped up over imperfections which is my area of focus for him, to have more measured responses and expectations. Lauren gives us a solid B+ on the “name game” as “The Aspiring CEO” with strengths in money, career and communication and no grade below a B-. Eh, sorry not so good from the “experts”, communication is her area of focus to improve as she is demanding of others to fit into her system and she quickly loses patience. On the other hand, she is magical with money, ultra-consecutive and thrifty and carries a sixth-sense in business. Nicole gets a solid B as “The Happy Family Lover” with areas of strengths indicated in academics and career with weaknesses in health and finances. Ouch, going downhill here for the “experts” as she is fiscally conservative, adept at investing and holding on to her money earned. However she is very driven and focused and hits her goals. Her focus to work on is health as she can lose patience with others and feels like others slow her down in her pursuits. Olivia, ouch that one hurts baby “experts”. They give the name Olivia an average C which is funny, because Olivia Elise is probably my favorite name among our kids. “Not my favorite child, Ms. Olivia! Nice try, but you know I don’t have favorites!” 🙂 Her best name grades as “The Peaceful Adventurer” with strengths as communication and career. Who knows? At this point, I’m getting pretty bored with this name expert service. But she is definitely peaceful and more likely to withdraw than to enter into conflict. Which leaves us with Emily whose names rings in as “The Wandering Explorer”, a B- with career and finances as her supposed strengths. Wandering Explorer is definitely her style as she marches to her own drummer. But those strengths? Hard to say, she’s nine years old, strong and opinionated but determined as hell so I think whatever she sets her mind to, is hers. But then again, we’ve raised all of our children to be passionate, focused and adaptive. Our biggest need to teach them still is patience, with themselves and with others. But that is to be expected with kids who’ve been taught to work hard, to get things done with or without others who may or may not get on board with their vision. So after twenty years and five children, we are still thrilled with the name choices we made so long ago. All of our names rank as Bs except for my favorite name of the bunch which fell to C. Olivia Elise was named after one of our favorite singers (Olivia Newton-John) and one of our favorite movie characters, Elise McKenna from the movie “Somewhere in Time” portrayed by the ageless beauty, Jane Seymour. In conclusion, clearly, I value the importance of naming our children which is why I looked at the process from nearly every angle. None of our children were named after family nor after the waitress who served our meal in the restaurant the night before the birth. Names have social histories attached to them for better or for worse and we do make decisions in life based on our own personal experiences and on history. If you met a man today and found out his name was Albert, you might think of Albert Einstein or “Uncle Albert” from the famed ex-Beatle, Paul McCartney’s song and there is a good chance you would think positively of Albert. But if his name had been Adolph, probably not such a positive name in most of our memories. Our overall grade from the baby name “expert” site averaged out to a B- but frankly, I feel much stronger about our selected name, our homework in the process and well, for each of our children and how their name fits them, I’d give us an A- overall as I am a bit pissed I missed that “NeRD” thing. But then again, when she was born, we had come through a rough financial time as we started LifeMAPP ( what we’ve now re-branded to PIQ Living ) and so victory or rebirth were perfect symbols of where we were at that moment in life. Her name and any initials they created were perfect. So, how does YOUR name rank in your culture and among your peers?